Cusan Tan are a Welsh duo of Ann Morgan Jones on vocals and flute, and Sue Jones Davies on harmony vocals, who have paired with various instrumentalists on tour and on record, especially the triple-harper Robin Huw Bowen. 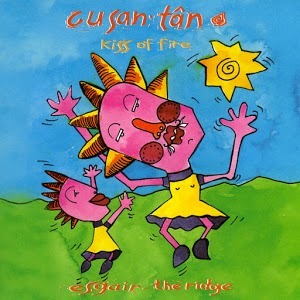 The two came together to form Cusan Tan (Kiss of Fire) in 1990, when the two got to know each other from collecting their children at the same school in Aberystwyth. Ann had studied flute at the Royal Academy and played at various musical festivals, while Sue had sung and acted in a range of productions, from Jesus Christ Superstar to Monthy Python's Life of Brian. Most of their repretoire is written by Ann and mixes traditional with 'contemporary' influences, songs with solo instrumenals and spoken pieces. Their debut album includes guests Robin Huy Bowen, John Rodge and Robert Davies on guitar, Arthur Gwynn Morgan Davies on cello and Dafydd E. on harmonica.